Launch season is officially underway after Haas revealed the livery that will feature on the VF-17 at a special ceremony in London. 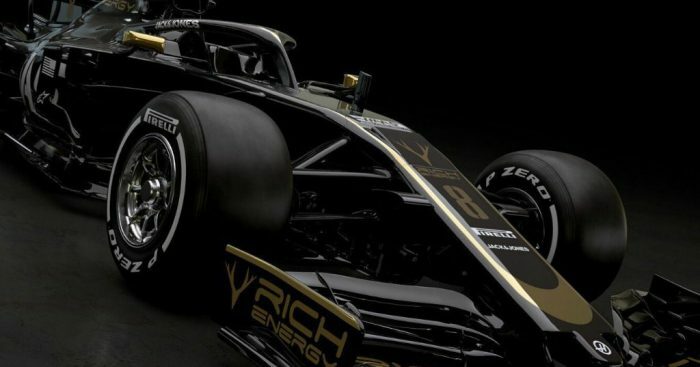 The American outfit, competing in their fourth Formula 1 campaign after joining the grid in 2016, have bagged themselves title sponsors in the form of Rich Energy and that is very much reflected in the black-and-gold livery choice for 2019. Drivers Romain Grosjean and Kevin Magnussen were present at the launch and joined by Haas team boss Gunther Steiner and Rich Energy CEO William Storey, who made a bold prediction about Haas’ chances this season. But, prior to the live event getting started, Haas revealed their new look on Twitter. And gave us a view from the new front wing for good measure, too. Grosjean and Magnuseen then peeled off the covers on the real thing shortly after. Team principal Steiner said upon launch: “It’s important that we keep progressing as a team, and this season is no different. Our partnership with Rich Energy is another positive example of moving forward as an organization. “We’re pleased to see their colours on the VF-19, we welcome them as they join our valued partner group in utilizing Formula One as a global marketing platform. Haas confirmed that the London launch event was to show off the new livery. The actual car launch will be in the pit-lane at the Circuit de Catalunya just before winter testing begins on Monday, February 18. “It’s pretty cool, isn’t it?” Magnussen added at the London launch event. “It looks angry. “Testing will be an exciting time as it will be the first time you get the feel the car and get the first early idea of whether or not if we are going to fast. “The front wing will be the biggest change,” said Grosjean. “It actually does not look like a lot of difference but it’s a lot of work for the engineers. For a closer look at the VF-19, head to our gallery right here.